A writable Logbook for New Vegas made by wondrous Hemingway308 and me. It will be automatically added to your inventory once you activate the mod. You will find it under Apparel, like armors and outfits. Once you'll click on it, you will be kicked out from pipboy and after an instant it will open. 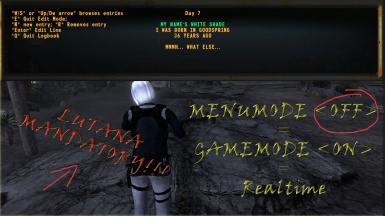 This mod can be considered free FOR NON-COMMERCIAL USE ONLY - please credit the deserving, when deserved - Any mod that contains any assets from this mod MUST BE FREE and share the SAME free use policies. There are NO exceptions for this: if you don't like this rule, don't use this mod or any of its assets. Added Groovatron compatibility, now you won't see its commands and menus working when you have the logbook open. Note: this update SHOULDN'T REQUIRE a clean save. If you'll notice weird things, please contact me so we can debug together. But if you prefer to solve issues fast, simply do a clean save. 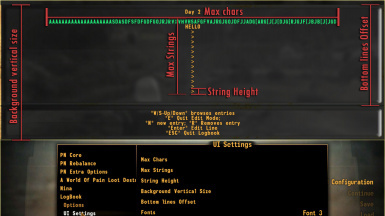 3.0 - Since ENB users can have problems in erasing characters with Backspace, I also added the left arrow to erase the last character you are editing. Patched TTW - now TTW users should be fine to use this. They'll receive the logbook when "Escape!" is completed. Corrected a critical issue where non-Lutana users had an annoying problem with the UI. In the meantime, Lutana user could have issues if they were enough unlucky. Thanks very much to FoxiShandris and JackTheShadow123 for the patience in debug this one. If you updated from a previous version, it would be good if you do a clean save if you experience something not working as intended. 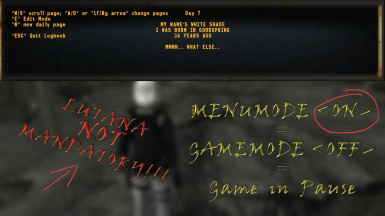 V.5 (09 november 2015): this version now allows to play with mods that alter your start, i.e Alternate Starts, Project Brazil, DUST. Normally, the mod would initialize only if you finish the first quest (Doc Mitchell or the vault if you are playing with TTW). So I introduced a new option in the MCM which forces the initialization. Just choose that option and close the MCM, when you'll go back in game you should receive your Logbook in few seconds and everything should initialize fine. 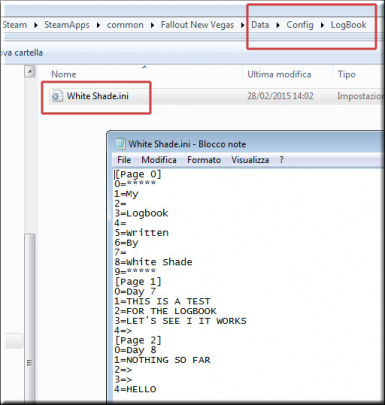 A writable Logbook for New Vegas made by wondrous Hemingway308 and me. It will be automatically added to your inventory once you complete "Ain't that a kick in the head" in NV or "Escape!" in TTW (the first quests of both the worlds). You will find it under Apparel, like armors and outfits. Once you'll click on it, you will be kicked out from pipboy and after an instant it will open. > N adds a new page, it can be done only once a day. If you are in Edit mode it will add a new entry (line). > WASD or arrows browse through the pages and the entries. > E goes in edit mode: at that point you will see the selected line in green, if you press <Enter> a cursor will appear on the line and you will be able to write. <Enter> again will confirm your sentence. To quit EDIT mode press E again. > R removes a line, except for the very first entry (the one named "NOTHING SO FAR" when you create a new page). > N adds a new line, the line will be added just under the point where you actually are (the green hightlight line). If you press down arrow over the last line, you will automatically add a new line at the end (exactly as if you were pressing N and you were in the last position). NOTE: all these keys are written as description under the logbook, when you open it, so don't worry if you forget them. GameMode is "realtime", the game doesn't stop. 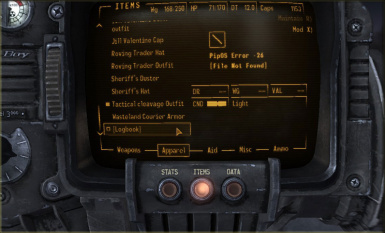 It's more realistic, it will show an animation of your character pinching on the pipboy. If you are using a pipboy replacer / remover, it still shouldn't be that bad. Since you can be attacked, there's a safe script that will kick you out from the logbook if a creature is near you. There's a video under the Video tab, which shows the difference in game. > You can configure many elements of the UI using MCM to adapt it to your needs. > You can save the logbook on a file if you have Lutana installed, the file will be located inside Data\Config\LogBook and it will have the name of your player. > If you don't want console spam, you probably will want to unflag the Debug option. > The AZERTY bug is an annoying issue with some localized versions. If the logbook writes fine for you, ignore this option. If you have issues while writing (wrong letters), try to flag this box. If it doesn't solve, contact me please. In game, you should wait for a message on top left, "Logbook initialized", which tells you when you're ready to use it. 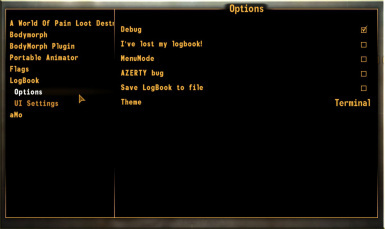 NOTE: it would be a nice idea to not save the game with the logbook open, while you are writing. 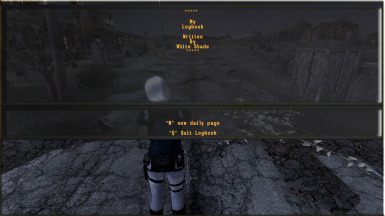 OTHER NOTE: in case you start a new game, you will (should...) receive the logbook after you finish "Ain't that a kick in the head quest" (the small tutorial on Doc Mitchell's house) in case you are playing NV, and "Escape!" (the quest to quit the vault 101) in case you are playing TTW. NOTE FOR UPDATES: if after an update you'll notice something not working as intended, you should try to make a clean save. This will mean erasing what you wrote, I'm really sorry. However maybe you could try to export them via MCM before, so at least you have a written copy. Theoretically there wouldn't be the need of further updates unless some big new issue needs to be corrected.